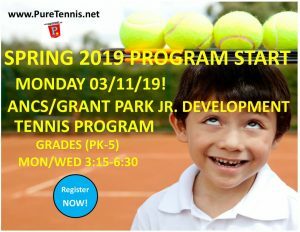 JR. Tennis Enrichment Registration Open! Our Junior Development Tennis Programs are designed to stimulate and challenge children of all levels, age groups and abilities. Our future Champions will learn more than how to hit a tennis ball, they will learn good sportsmanship, teamwork and how to have fun playing the game of tennis! Coach Tony and his professional staff strive to know everyone by name and take a personal interest in each student. If you want your children to have a positive tennis experience, where the tennis is serious but FUN, sign up and reserve a space NOW as there is limited availability. • Minimum of six participants per 60 minute session. Each session will be limited so SIGN UP EARLY! Registration for this exciting program is a “first-come, first-served” basis. Any delayed full registration/payment does not guarantee your reservation in this program.